When I was much younger, I was a very active thespian. Throughout my youth, I was active both on the stage and behind the curtain. In fact, in sixth grade, I even directed an adaptation of The Wind in the Willows. Sure, it was an overambitious project for a child to undertake- and sure, I underestimated the length of the play and as a result we were forced to stop at the end of the first act with an actor walking out on stage and announcing, “And thus began, The Wind in the Willows!” waking up the parents in the audience to let them know it was time to applaud. But I enjoyed it nonetheless. So how excited was I when I heard that Bombyx was publishing a game not only about the theatre, but featuring anthropomorphic animals? Very! Does it warrant that excitement? Well, let’s take a look, shall we? 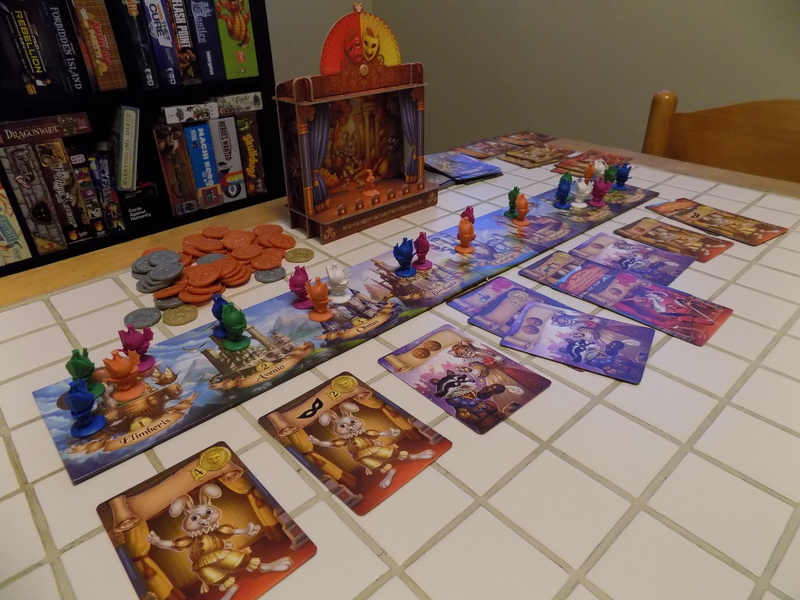 Histrio is a game designed by Bruno Cathala and Christian Martinez for 2-5 players with games lasting around forty minutes, or so. 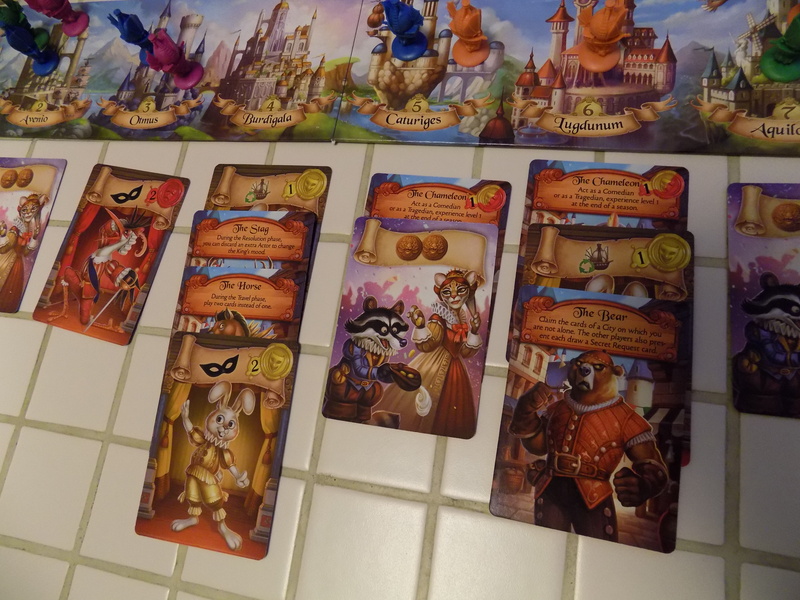 In this game, each player will be taking command of a theatrical troupe, touring the kingdom in your airships (or Caravels, as the game calls them) to recruit actors, acrobats, and try to scrape together as many coins (or Ecus) as you can to come out on top! However, you’ll want to keep an eye on what type of stagecraft the King happens to be preferring- Comedy or Tragedy- as that can be crucial to getting the leg up on your competitors. This game plays out in two halves (each called a Season). In each round of a season, a card will be dealt out to each of the eight cities in the kingdom. These cards will either be either actors (comedians or tragedians, which may have special abilities the moment you collect them, such as stealing money from another player, etc. ), acrobats (who each have a special ability you can use once a season), or cards showing various amounts of money. The cities are numbered one through eight, and you have a hand of cards, each labeled with a number in the range from one through eight. At the start of the round, each player secretly decides which city they want to visit and places that card face down in front of them. All players reveal their cards simultaneously, place one of their Caravels on the city they’re visiting, collect the cards located at that city, and then discard that numbered card they just used. Simple, right? Well, not quite. You see, any actors or acrobats you collect join your troupe. However, when you collect the cards from a city, you may decide to send an actor from your troupe to the court to perform for the King. If they are a comedian, they’ll cause the King to like comedies more, and if they’re a tragedian, they’ll cause the King to like tragedies more. The larger the number on the actor card, the greater the effect. 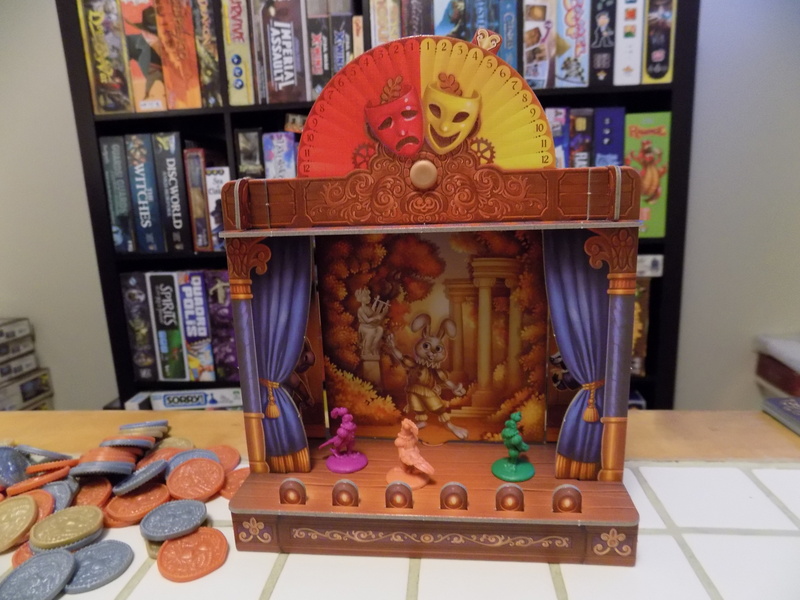 You see, the centerpiece of this game is a cardboard theatre, the backdrop of which displays whichever form of drama the King prefers. If enough comedians are sent to court to cause the King to no longer prefer tragedies (or vice versa) then the backdrop flips, showing the new preference of the King. Why is this important, you ask? Well, at the end of the season, the preferred form of stagecraft will greatly impact the amount of bonus money a player can receive. For instance, let’s say that at the end of the first season, the King prefers comedies. Each player right off the bat receives an Ecu for each comedian in their troupe. Furthermore, they then total the numbers on their comedians and subtract the total of all the numbers on their tragedians. If the result is a positive number, then they’ll land an extra three extra Ecus. In addition, the player with the highest final number gets that three Ecu bonus doubled (for a total of six.) 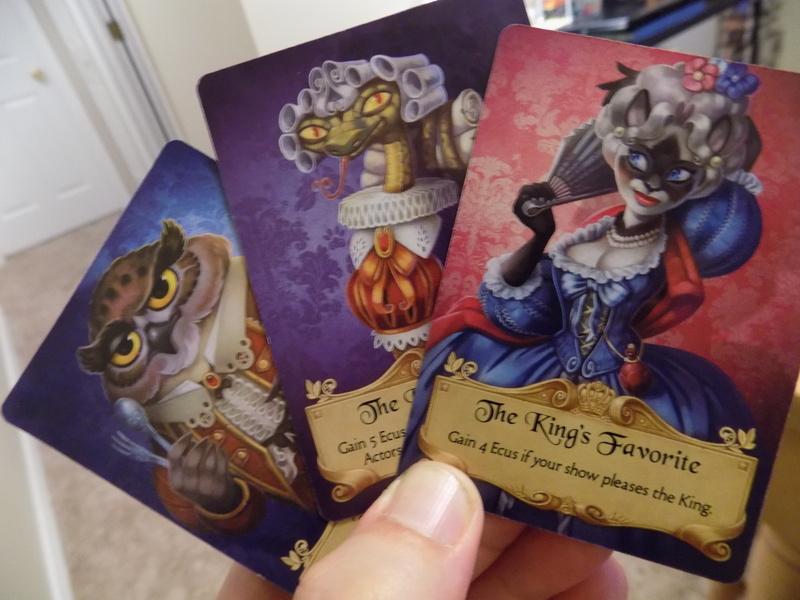 Since at the end of the second season (at the end of the game) the amount of Ecus is changed from three to five (and having the largest number nets you an extra five) these bonus Ecus can greatly change the outcome of a game of Histrio. So this game quickly reveals itself to be one of many simple choices, layered one atop the other. And like a finely crafted sonnet, there’s more to explore than you might think with your first reading. There’s a balance to be kept between composing your troupe with actors of a certain discipline (either comedy or tragedy) and sending an actor to court to try to change the King’s mood. In addition, you’re keeping an eye on that cardboard stage, ever wary that someone could push the king too far in a certain direction, changing his mood and suddenly making your troupe irrelevant. In addition to all this, there’s the caveat that if two players try to go to the same city at the same time, two things happen: first, neither player gets the cards at that city and any actor cards instead get sent to court possibly changing the King’s mood and second, each player gets a Secret Request card. A Secret Request is kept hidden by a player and can be played at the end of a season to net that player extra Ecus (if the requirements on that card are met.) Just like having a troupe that is complimentary to the King’s mood, fulfilling a Secret Request can really tip the game in your favor, helping players who aren’t doing so well catch up with the others. By the end of a season, you’ll have an impressive troupe infront of you- but will their dramatics please the King? 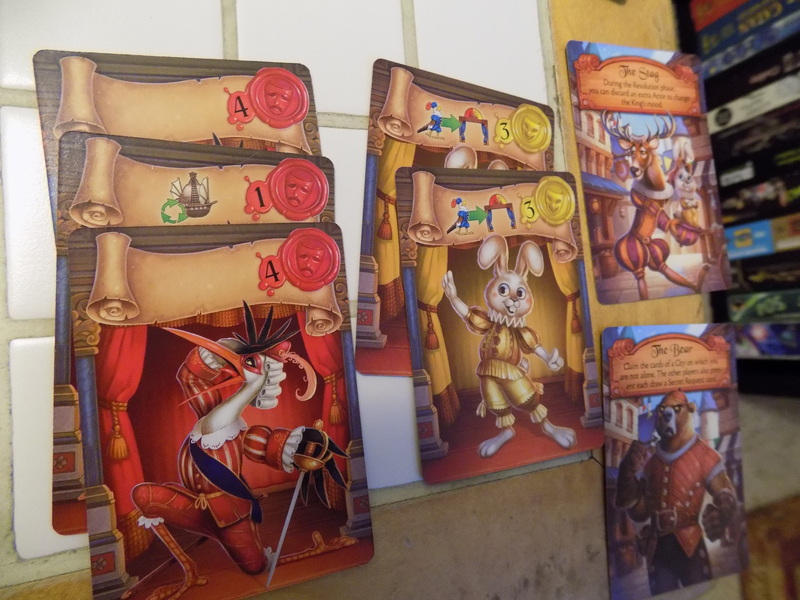 Histrio is an interesting box of possibilities. With beautiful, charming artwork, a novel, original concept, and simple, easy to teach rules, this game has stepped off the stage and into my heart. This game has quickly become one of my personal favorites and a pride of my collection, perfect to pull out when I want to give my players something new and different that isn’t too rule heavy or intimidating. And can I just say that the little stage that represents the King’s mood is one of the neatest props I’ve ever had the pleasure to find in a game. It’s well designed and doesn’t feel superfluous (as I had originally feared.) 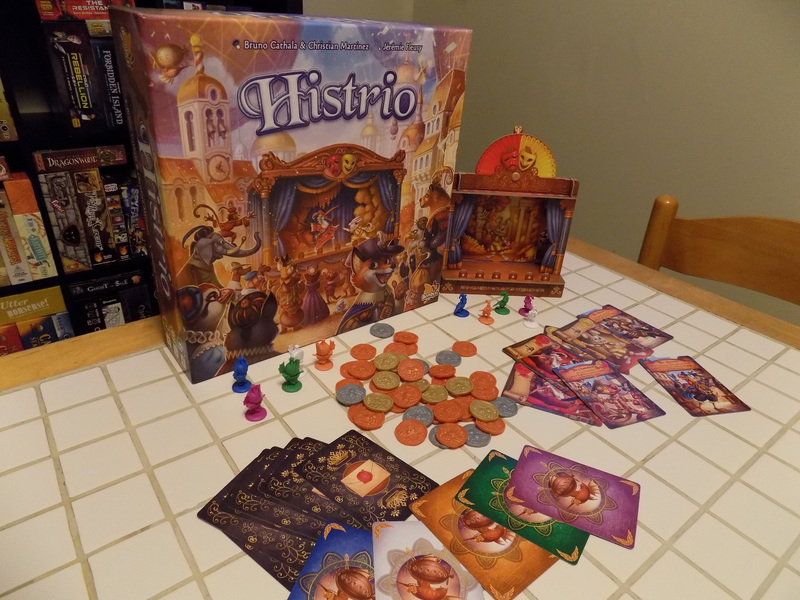 So if you couldn’t guess already, A Space Ahead heartily recommends that you try Histrio. Now if you’ll excuse me, I’ll return to reminiscing about my past days of thespian glory.